Experiencing a headache while sleeping can be frustrating, as the pain may prevent you from getting adequate rest and negatively impact the upcoming day. 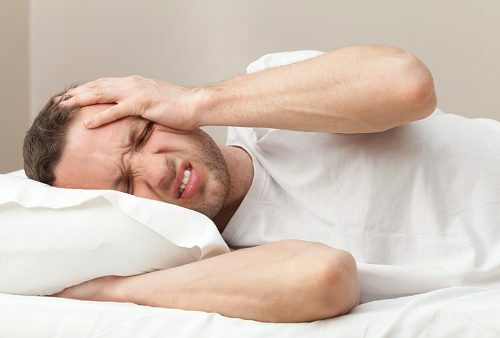 The most common type of headaches that occur at night or during sleep are cluster headaches and migraines, as well as hypnic (or “alarm clock”) headaches that awaken the sufferer at approximately the same time every night. The following article will explore the connection between sleep and headaches as well as what can cause headaches to occur during sleep, how to ease them, and finally, how you can get a better night’s sleep. Sleep and headaches: What is the connection? While headaches may be considered a symptom or warning sign of various sleep disorders, research has also shown that sleep disturbances often occur in those who have frequent headaches. There is no doubt that sleep and headaches are connected, but the strongest relationship between headaches and sleep is found in the number of REM cycles experienced. Migraines occur in direct correlation to the amount of REM sleep periods experienced per night (with the normal average being between four and six), and this connection is even stronger in relation to cluster headaches and REM cycles. Headaches have also been associated with the decreased oxygen intake and transient hypertension caused by sleep apnea, and these factors have been theorized to cause early morning headaches. Can sleeping more help with headaches? Getting too little sleep can aggravate headaches, but the same is also true for sleeping too much. This is due to the fluctuations in serotonin and other hormones that occur during sleep. These fluctuations may increase an individual’s likelihood of experiencing a headache while they are sleeping or once they wake up. Similarly, while those in adolescence may find relief of headache pain in the form of daytime naps, many adults report that frequent napping during the day may trigger a headache and reduce sleep quality during the night, resulting in a headache the following morning. What causes headaches while sleeping? Sleep apnea: Sleep apnea occurs when the airway changes during sleep, partially obstructing the flow of air in and out of the body and disrupting normal breathing patterns. This sleep disorder can cause headaches that are felt during the night or as a person awakens. Hypoglycemia: This describes the condition when blood sugar levels are lower than normal. This issue can cause headaches as well as night sweats and may be combated by enjoying a light snack before bed to help regulate your glucose levels. Sleep position: If you sleep in an awkward position or use a pillow that does not provide adequate support, you may feel a headache throughout the night or upon waking. Tension and stress: If you experience a lot of stress throughout your day and do not give your body a chance to relax before bed, you may experience a tension headache that is felt while you are trying to sleep. Reduce and manage daily stresses to better avoid these headaches. Sinus headaches: A sinus infection may cause you to experience headaches at night when you lay your head down as pressure in the sinus shifts. You may also experience these headaches if you are allergic to the dust mites that may be found in your pillows or sheets. Migraines: If you experience migraines at night, be aware of what may be triggering them. Try journaling each night about what you eat and drink, what rooms you spend time in, and whether there are fragrances present, as these may all be triggers of your nighttime migraines. Discovering these patterns and triggers that cause migraines is the first step to avoiding them and getting a better night’s rest. Hypnic headaches: These headaches have also been referred to as “alarm clock” headaches as they occur at the same time every night and may wake you from sleep. These disturbances may be caused by changes in the vessels of the cerebrovascular system or previous head injuries and are more common in adults aged 50 and older. How to get rid of a headache while sleeping? If you are experiencing headaches while sleeping, then you most likely will want to know how to get rid of them as they can disrupt sleep and hinder your performance of regular tasks in during the following day. Depending on the type of headache you are experiencing, there are ways to treat and prevent their occurrence. For a hypnic headache, your doctor will most likely prescribe a medication to be taken orally such as lithium carbonate, anti-inflammatories, or melatonin. Sinus headaches should also be assessed by your doctor, as if they are due to an infection, you may require medication to clear up the condition. Similarly, if your sinus headaches are caused by allergens, you may need to buy new sheets and pillows to prevent aggravation. If your headache is due to sleeping in an awkward position, it may be beneficial to change out your pillows or invest in a new mattress. Finally, stress headaches can be prevented by better managing your stresses throughout the day through activities like exercise, yoga, and meditation. To prevent nighttime headaches and ensure a better night’s sleep, the following tips may be useful. Schedule your sleep: Setting a regular sleep schedule can help regulate your circadian rhythms and ensure you are getting adequate rest each night. Keep to this schedule as much as possible and avoid sleeping longer or going to sleep later on weekends. Relax: Before settling down to sleep, try practicing yoga or a breathing exercise to help calm your mind and body to better put you at ease for a restful night’s sleep. Avoid watching television or reading in bed, as this will engage your mind and make sleeping more difficult. Adjust your diet schedule: Cut back on your fluid intake before bed in order to prevent frequent nighttime trips to the bathroom. Similarly, finish eating four hours before you go to bed, as much of the fluid we consume comes from foods as well as liquids. Cool down: If you frequently experience migraines at night, sleeping with the air conditioning or a fan on may help you fall asleep during a migraine attack, as can placing a cool towel on your head. Review your medications: Talk to your doctor about the medications you are taking—including any natural remedies or over the counter medications—as he or she will be able to determine if your medications are interacting in a way that may lead to headaches or sleep disorders. Headaches while sleeping can be disruptive and prevent you from getting the rest you need. While there are many causes of nighttime headaches—including medical conditions, stress, and even your sleep position—there are also methods to prevent them based on their cause. If you are experiencing headaches while sleeping, talk to your doctor to discuss your treatment options and come up with a relief plan that works for you.